This post was written by Jessica, from BookSaleManager.com. In today’s economy, stretching the dollar has become more important than ever. Now I know this line sounds a tad clichÃ©, but it’s none the less true. Typically when households start tightening their budgets, one of the first categories to receive trimming is entertainment related items. This includes items such as books, DVDs, CDs, and magazines. Today I want to talk about an easy way for you to cut costs in this area while at the same time helping out your local libraries or nonprofit organizations. What exactly am I talking about? Charity book sales of course. Many Friends of the Library organizations, private schools, universities, and various nonprofit organizations (such as Planned Parenthood and AAUW’s) run events like these as fund raising mechanisms. 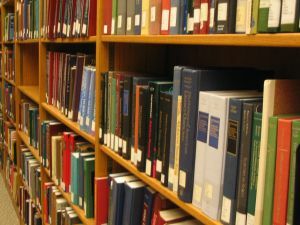 They usually receive books and other media items from donations (or in case of libraries, withdrawn books) and sell them at substantially discounted prices. A typical charity book sale will sell hardbacks for under $3 and paperbacks for under $2. They also can have great deals on CD’s, DVD’s, magazines and even VHS tapes. Sales like these are a bargain hunter’s heaven. Not only can you find amazing deals, but all the money you spend goes to a great cause. So how can you find these sales? That’s where our site BookSaleManager.com comes in. Our site is designed to help nonprofit organizations advertise their sales. On our site, organizations can freely list their book sale or book store. This listing gets placed in our searchable database. Users can use this database to find sales by state, zip code, sale size, and date range. Furthermore, (for you avid bargain hunters) BookSaleManager.com even allows you to create a free account where you can save sales to your very own calendar, or receive notifications when new sales are listed near your zip code. Essentially, our goal at BookSaleManager.com is to connect organizations running these sales with all you eager bargain hunters out there. You save more money, and these charities generate more revenue. We believe this a total win-win situation for all involved! Kelly says: I almost never buy new books, even living in France, where cheap, used books in English are hard to find. Instead I use the small, local English library, BookMooch and my circle of friends to find new reading material. Where do you get books? Do you buy used? New? From booksales like Jessica described? Or do you use a swapping service or the library? My sources include a local used bookstore, friends and BookSwap. Love them all. .-= Nancy´s last blog ..Spending Freeze =-. I love those sales! My library has one that ends with a box day- fill the box for $5! .-= Kasey at Thrifty Little Blog´s last blog ..When does thrifty go too far? =-. There are tons of cheap books (and DVD’s) at flea markets! People sell them for $1 to 2 and a lot of times DVD’s are around $5. In my town there are a couple of used book sellers that usually sell books for $2 to 3. Don’t forget that the library is always free! I mainly rely on the library and I have a small amount per month to buy books. I never buy in Barnes or Borders, I usually use Amazon to find gently used books. I’m not the best example for saving money on books, I just can’t resist buying them. I will make sure to check the website. I love our local library’s book sale! They sell most of the books at $1 for hard covers and 50 cents for paperbacks. They also have a section of books individually priced (gift quality, art books, sets, signed, etc). It is the best way to get books for kids and homeschooling. I’ve picked up so many beginning readers, art books, classic children’s literature books and so many more. Last year I got 50 books for $54! Costco. I buy a lot of nightstand books at Costco, because it’s easy and doesn’t require a separate trip to another site. Costco’s prices on paperback novels and biographies are pretty cheap. Estate sales. These are excellent sources of often near-new books. I’ve picked up some beautiful, apparently unused cookbooks for five bucks — they would have cost upwards of $30 new. Volunteering to work at the library. Libraries will usually give their volunteers first dibs on books to be sold or thrown out, before the sale begins. This is a way to get free books. Around here we have a Visiting Nurses book sale which used to be a very big deal (haven’t heard about it lately, come to think of it). It was SUCH a mob scene that, to my taste, it wasn’t a very pleasant experience. I don’t enjoy being jostled and elbowed after standing in line for 45 minutes waiting for the door to open, just to save a couple of dollars here or there.